An important piece of functionality in org-mode is the ability to capture notes and ideas (using capture mode) and storing in a nominated location. Date Trees are a method of specifying a location based on the date. A new window is displayed with a list of templates. Each template has an associated short cut key, for example n for notes and t for a Todo-list item. Continue whatever you were working on. If you would like to go to the point where the item was filed, enter the very useful command C-u C-u F6. a type of entry. These can be an org-mode entry (node) with a headline, an item in a list, a checkbox item (checkitem) , a line in a table (table-line) or plain text. Note how the templates are spread across multiple lines. If you want some text to start on a new line then format the template accordingly. For example the "Added:" text starts on a new line. Here is screen capture of Emacs after capture mode was started with F6. Compare the descriptions and short cut keys to what is displayed. I save my files in a folder which is synchronised between my office and home computers using the web-based DropBox service. Some of my items are filed after a specific headline in a file. Appointments are filed under a heading Calendar. Other entries are filed in date trees. These are explained in the next section. 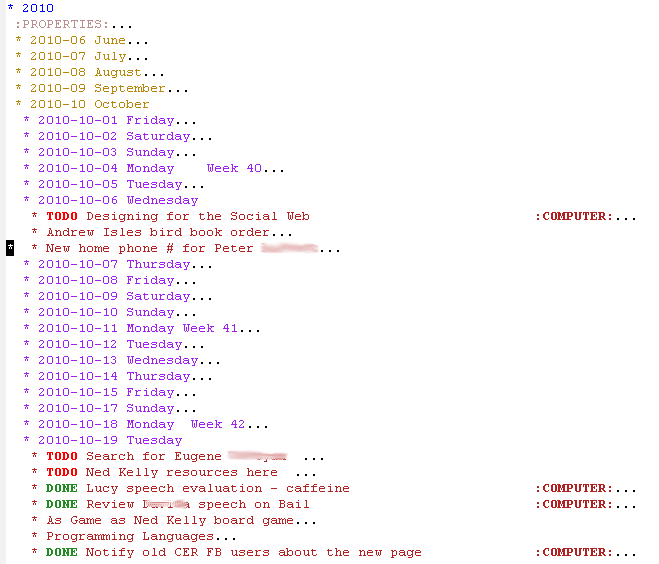 Here is a screen capture from one of my files showing a date tree. Capture uses template definitions (stored in your .emacs startup file) to define where information should be stored and in which file. One of the target types is a date tree: (file+datetree "path/to/file"). When a new headline is created in a date-tree, Capture searches from the beginning of the target file looking for a match on the year. If it is not found, then a level one headline is created. The process is repeated for the month then the day. Missing months and missing day headlines are not created to fill in gaps. It is possible to attend text to the headlines and not interfere with Capture. This allowed me to manually enter the week number (read from the agenda view) to help me indentify the beginning of the week. You may want to add tags to these headlines. I am used to writing notes in a hardcover notebook. This is my journal where I rule a line at the beginning of each day, write the date and day then add notes during the day. Date trees and capture allow me to replicate this functionality. I am also used to using a diary for identifying appointments and deadlines. 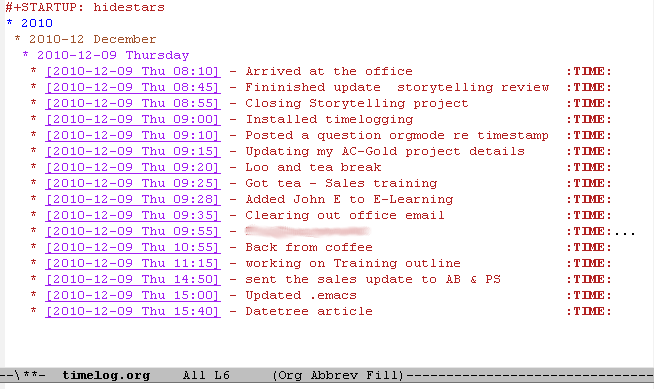 The agenda view gives me this functionality with the need to move brances (headings) in my org-mode files. Date trees give the functionality of writing entries into a "diary" on a dated page. I use a file named taskdiary.org to capture my notes and "To Do" list items as branches on the tree. The Notes template prompts for a headline text then positions the cursor under the headline to type or paste text. The Task templates prompts for a headline text as well as a category tag. The TODO keyword is included in part of the template. In both templates I add the date and time created as this provides useful tracking information, especially when items are refiled. I could have captured notes in one file and To Do items in another file, but I wanted notes and tasks to coexist "on the same page". Sometimes I will convert a note into a TODO item and it is easier to do this when the item is stored in the same file. The Journal template is used to record information for long term storage such as diary entries, details of books I have read and things I have done. Once an item is in the Journal file I don't move it. I only use the Journal file on my home computer. The Receipts is used for recording payment details resulting from Internet banking and online commerce sites. I found it is more suitable to keep financial information separate from other journal entries. This template is only set up on my home computer as I only work on personal finance at home. On Wednesday (2010-10-06) you can see one To Do item with context of COMPUTER and two note items. On Tuesday (2010-10-19) there are two To Do items and 3 completed (DONE) tasks. This date-tree is the basis of my task management system. Notes are added with the n capture template. Reviewing this weeks nodes - Each day I quickly scan the items added since the beginning of the week.